This 27-cube design and ctyrrad (described in my book, but not on the Web) have a lot in common. These two designs have the same basis: the Purdue pattern from my book must be constructed on all corner and edge cubes of both designs. The subsequent method differs. I cannot reproduce all algorithms for both designs. I would need to have the individual cubes in my hands and gradually build patterns on them. I must also pay attention to color control, so that all cubes form a continuous design. It is too much to carry in my head. So I use the "by feel" method. I strongly recommend this method, because you don't have to memorize anything (well, just a few automatized simplicities). Oh no, this is not for speed cubists, whose goal is to solve the cube in a record time. Here we play a role of artists, with infinite time on our hands. To create a decent, 3-dimensional and symmetric design is the main goal of this pursuit. Learning things by rote is an unproductive boredom. Creating designs should either be a source of relaxation after a day's work by building multi-cube designs for your own pleasure, or else it should lead to new directions in scientific research by using the cube to seek new computational methods. (Later I will talk about fractals.) A glass of a good and strong drink is welcome as a much-needed tool in constructing designs. When I decided to name my designs, I asked my mother to pick up one and I would name it after her. She selected this 125-cube design and I think she chose well. Six-colored Marie has two "opposite colors" on opposite faces and four "adjecent colors" on adjacent faces. 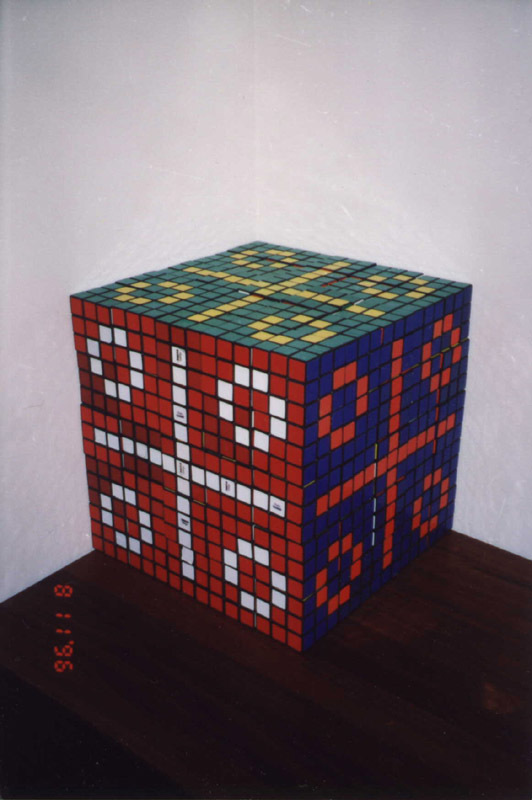 It is one of three designs (the others are Ctyrsprezi and "Jaroslav" (see on this page) but those are four-color designs), which require a special arrangement of parity pairs; corner cubes are not enough. The nearest-neighboring edges and the corner must also form parity pairs. Corner/edge is a Rubik's cube that acts as corner/edge in a given design. Both Josef and I use the same words. Josef describes algorithms for solving one cube, so that for him, corner/edge is a CUBIE, or a part of a Rubik's cube. 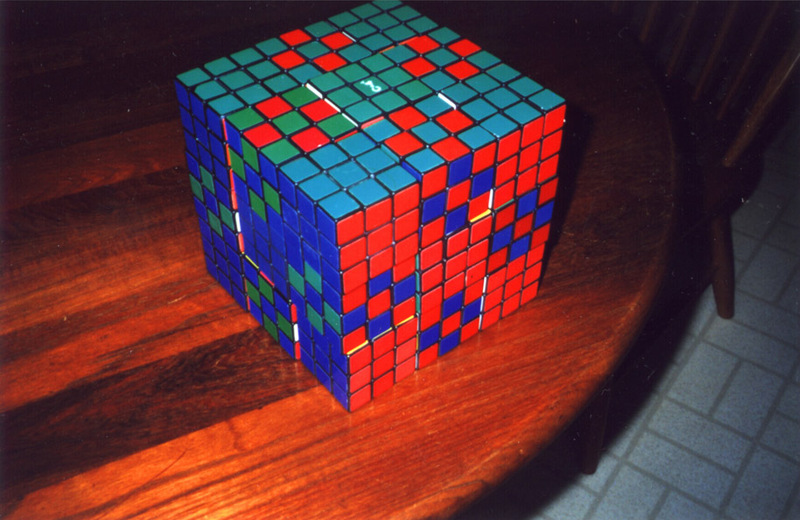 On the other hand, I describe multi-cube designs, so, for me, corner/edge is one whole Rubik's CUBE. Algorithms for creating designs can either be very simple or very complicated, but there is not enough space for any detailed dexcription here. Those interested in this genre are asked to consult my book. Arrangement of parity pairs influence a design's symmetry. Mirror symmetry is most widespread, the designs with such a symmetry are reflection-equivalent designs. Marie is such a design. You cannot see it on this page. You would need to examine Marie from all sides. Since this is impossible on the Web, you will just have to take my word for it. It is possible that these concepts are known in some marhematical field. It is equally possible that, after reading these texts and viewing these designs, some marhematician will berate me for my inexpert dabbling in their magnificient queen of sciences :-)). In 4 pictures on this page you may see fractal prototypes. They are not real fractals, but Rubik's cube designs similar to fractals. Two out of 4 pictures show variants of a so-called box fractal. The last picture shows a chessboard design as a combination of these two fractals. But a couple of introductory sentences should go first. (You can read some introduction to fractals; I cannot discuss them in detail here.) Fractals are geometrical objects that have self-similarity and fractional dimensions. One can divide fractals into "space" and "background." This is clear in the case of actual fractals. But there is a problem with Rubik's cube designs due to the fact that we cannot cut holes into Rubik's cubes, since we would destroy them. Thus we specify one color on a side of the design as "hole color", and the second color as "background color". Now we can state the rules of iterating these prototypes, as we will soon see. 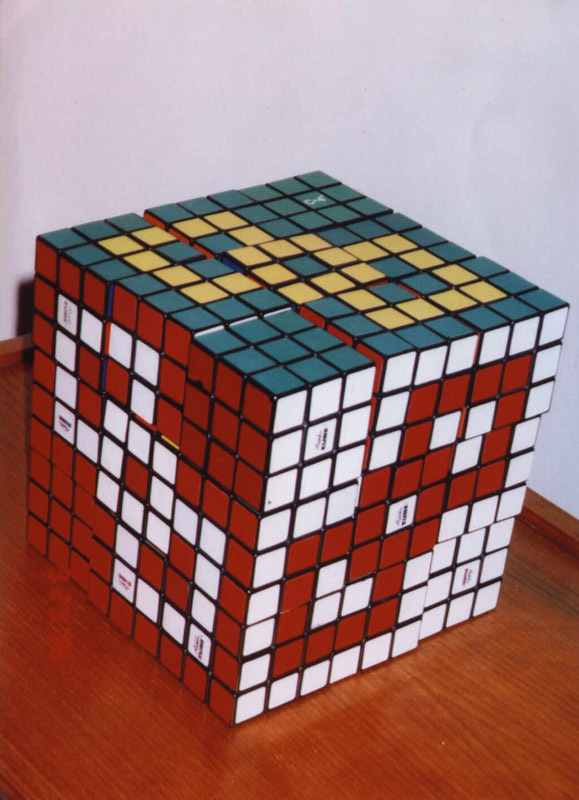 The Rubik's cube is an ideal representation of certain fractals and hints at their self-similarity, because it bears a resemblance to so-called Cantor set. 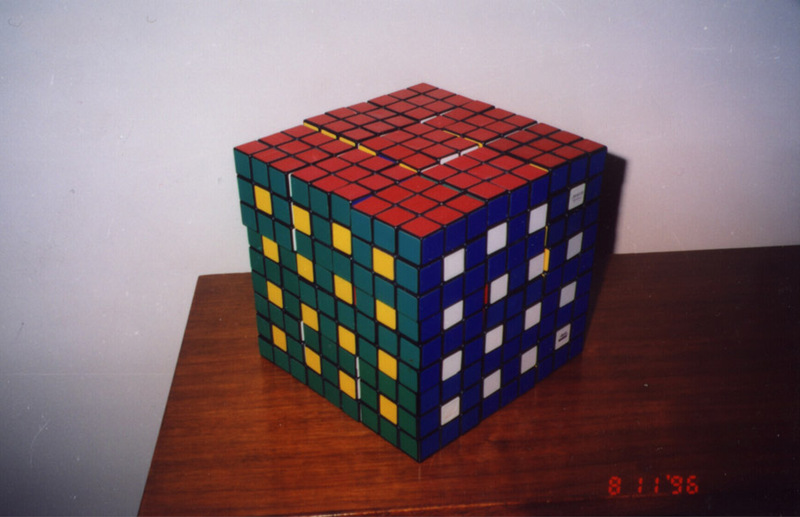 The first iteration of the Rubik's cube (the so-called seed) can be used for other iterations as follows: the cubie representing space is replaced by the clean Rubik's cube of the same color (enlarging the space), and the cubie representing the background is replaced by the seed of the same coloring. We can obtain the second iteration from the first one (the seed). The third and higher iterations can be obtained from the second and higher iterations in exactly the same way. Consider box fractal as an example. The picture in this reference (don't be afraid to click) shows 0th, 1st, 2nd, 3rd and 4th iteration of this fractal. Notice that the first iteration is the usual chessboard pattern on one cube, looking at its one side. The black color specifies background, the white color specifies space. Use the above-stated rules to get the second iteration. 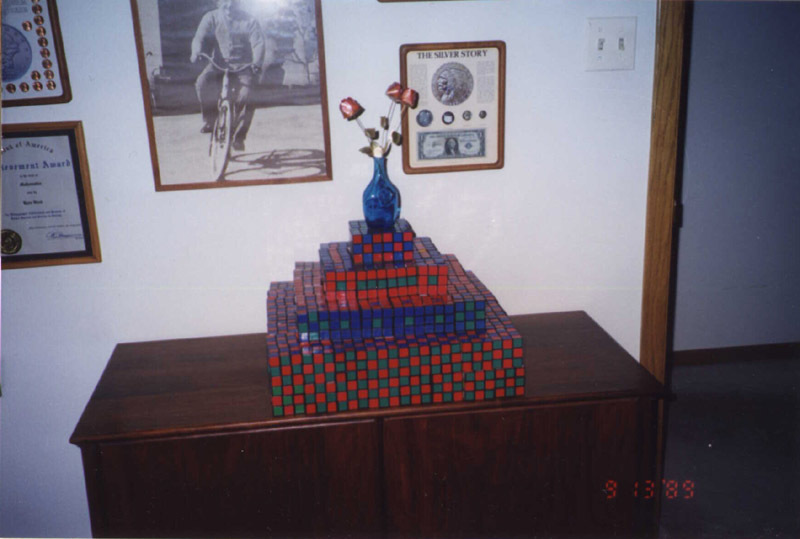 In this picture you can see the second iteration of the box fractal prototype as a Rubik's cube design. Please compare with the reference given here. Menger's sponge is a famous fractal, better-known than the box fractal in the previous figure. 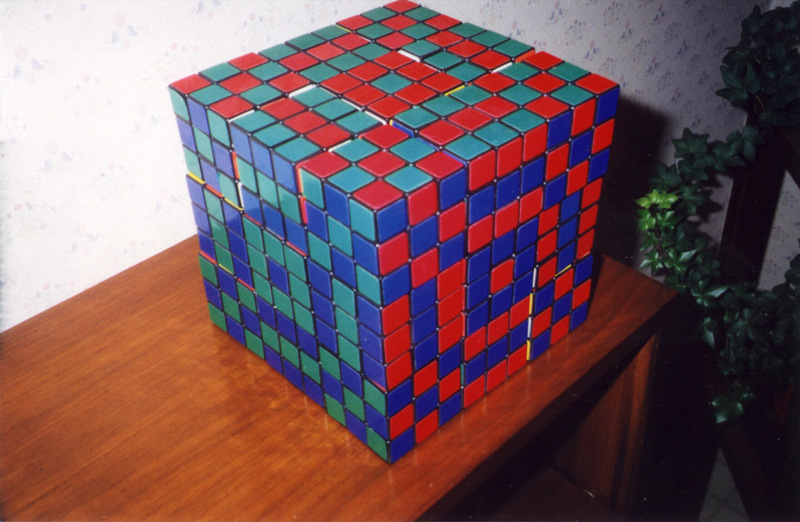 The seed of the Menger's sponge (its first iteration) is a Rubik's cube with a 6-O pattern. 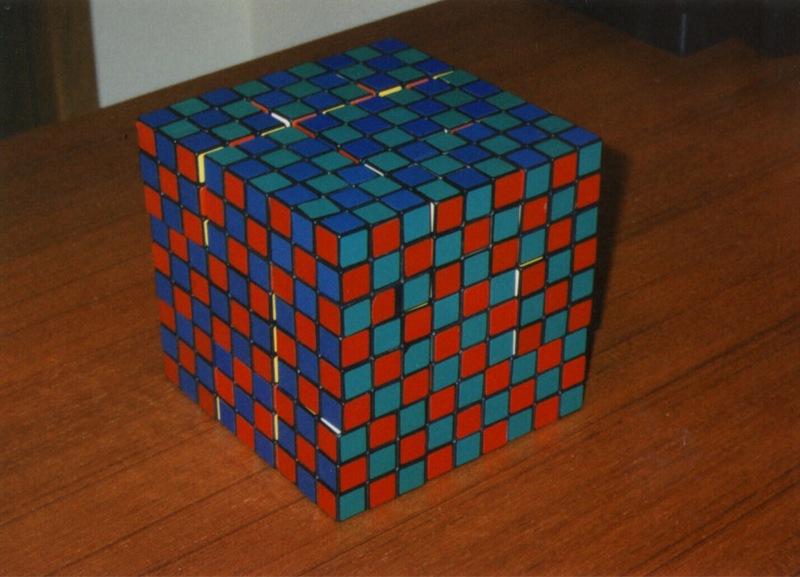 This pattern cannot be constructed on opposite sides of the cube, only on its adjacent sides. The prototype of higher than first iteration of the Menger's sponge is a three-color design, with the usual parity pairs in its corners. We construct the first iteration by drilling holes into the cube. Their area is the center square on all 6 sides of the cube. If we perform such an operation on a Rubik's cube, we will destroy it. I personally cannot afford that! And so I use a prototype again. The center square has a "hole color," and the 8 squares surrounding this hole have "background color". Use the same method of iteration as before in order to obtain the prototype of the second iteration of the sponge shown in this figure. Please compare with the second iteration of the actual Menger's sponge fractal. You can construct the third iteration from the second iteration in a very similar manner. Unfortunately, I do not have enough cubes to construct, photograph and show this prototype and I would like to... very much :-(. My father died before I started creating designs, so he did not have an opportunity to select one. I faced a problem, which design to name after him, because I could no longer ask. I did not want the design to be simple, because my father loved all things mathematical. The design had to be directly proportional to his hobby, the harder the better. I think I made a good choice. Jaroslav design has reslly curious arrangement of parity pairs. It has inversion, not mirror, symmetry. If you put its corners together, you will see that four are patterned and four are solved. Since this design has four colors, its corners must form the usual parity pairs. The midsections of this design must form parity pairs with patterned corners, and therefore cannot form parity pairs with solved corners. 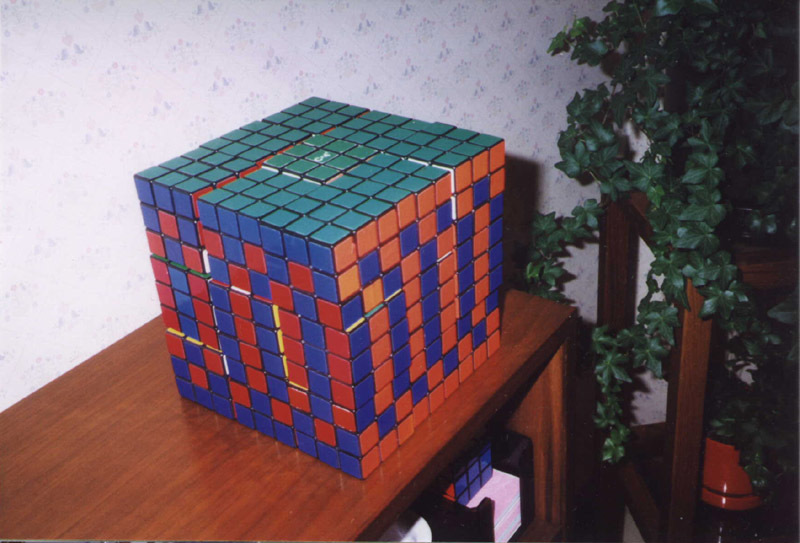 In a 27-cube design, these edge cubes are its only edges, as can be seen in the picture. I constructed this design from 125 cubes; such a design has 36 edges. Which edges form parity pairs with which corners, is something you can easily figure out. It is equally easy to deduce, what such a design might look like for an even number of cubes along a side (4, 6, 8 etc). 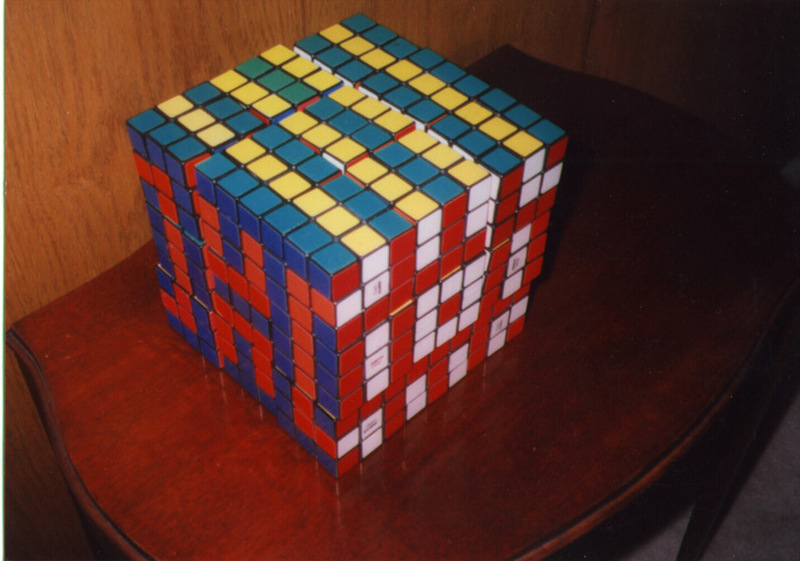 If you have enough cubes, try this out youreslves. It isn't THAT hard, a little thinking is all you need to do. And try not to make the same mistake I did. I turned the upper layer in the wrong direction relative to the lower layer. This means the upper layer did not couple correctly to the lower layer, and I was forced to retwiddle some cubes. Fortunately, I had solved cube parity pairs at hand, else I would be stuck. Be careful! If you compare front and right face (and therefore back and left face) of this design, with similar faces of the Design for Pedestrians (see on this page) you will find that the geometry is the same, but the colors are different. That in no way implies that shelter is as simple as he design for pedestrians! On the contrary. The colors on those 4 sides are adjacent, not opposite, and that complicates matters quite a bit. When you work with adjacent colors, you use quite a few clockwise and counterclockwise rotations, and those get easily confused (at least by me). As a result one often finds a holy mess in place of a symetric pattern. After uttering some four-letter words, you just solve the cube and start all over again. Maybe that is the main reason you don't find that many three-dimensional Rubik's cube designers around (Another reason are difficulties associated with color control, a set of algorithms used to make the design continuous and pleasant from cube to cube.) Shelter is not so hard, provided you can construct ctyrrad (see my book). Problem is, that ctyrrad is one of the most difficult designs in my book, with strict color control. True, the corners of shelter have more moves than the corners of ctyrrad, but those moves are few and fairly clear. The edges of shelter are considerably simpler than the edges of ctyrrad. Space requirements prohibit a detailed description. That is a matter for an article, rather than this short, informal discussion. The corners are new in this design. All edges have as basis the Purdue pattern; yes, they are the ctyrrad edges. 12 edges of this 27-cube design can be divided in three groups of four edges each. Red-white-yellow-green edges are similar edges of ctyrrad, but turned upside down :-). It may sound funny, but it's a fact. Blue-orange-green-yellow edges are ctyrrad edges, too, but with different colors. The situation is made harder by the fact, that the ctyrrad colors may not be exactly the same as the Vltava colors. You have to do a bit of thinking and twiddling to get this right. That stiff drink you have fuxed for yourself may be a valuable assistant at this point. And finally, the last group of edges is a bit altered Purdue pattern. The corners of Vltava are somewhat different. They sort of "cascade" from one side to the other in a symmetric way. In my book there is only one such design, called "Jarmila", with this "cascading" effect. Jarmila design may be found on the web; go ahead and click. Should you put together the Vltava corners only, you will see this "cascading" without disturbance from corners and edges. Of course, it is hard to see this in a picture; you should inspect the whole 3-dimensional design, or order the computer to turn the design as a whole. Is that possible at all? Let us again look at box fractal, but this time switch the hole and background colors of the first iteration (seed). In order to distinguish those two kinds of box fractals, we label them as A and B. And now we iterate in exactly the same way as before. If we do that, we obtain the prototype of the second iteration as shown in this figure. Higher iterations are of course possible, but I cannot show them because I do not have enough cubes. So that I don't complain too much, I should point out, that all fractal prototypes discussed here could be constructed as two-dimensional designs. When I write an article about those issues, I will have to do it. I will have to be much more detailed, than I am here. The question is, who would be interested in this subject. Mathematicians and other professionals in this field, would you like to see something possibly new? Now that I think of it, I come to the conclusion, that such squares take quite a lot of Rubik's cubes. A side of a square would take 9 cubes for third iteration, 27 cubes for fourth iteratio... STOP! I do not have 27x27=729 Rubik's cubes. And I am right back to square one. The corners of Malovicky design are similar, although not the same, as those of Box fractal A (see on this page). The centers are similar to Menger sponge cubes, but they have different colors. The edges are of note in this design. The basis of the edges is the Purdue pattern, described in Chapter 4 of my book. When describing designs, I try to simplify the already too hard color control, and try not to memorize to many algorithms. Similarly to the Vltava design I divide the edges into three groups; the colors on the opposite sides are different for each group. The edges are twiddled so that they match properly, as shown in the picture. Malovicky is a three-color design. Does it have parity pairs? Of course! I almost did not include this design. It is much too simple, certainly it is the easiest design in my collection on this page. But some people advised me to include at least one design that is, in my opinion, simple. According to their view, I have entirely too many complicated designs here, and this one is fairly elegant. I yielded to this pressure, particularly since this design is not described in my book. Josef discusses two kinds of coloring in Chapter 1 on this page. The first coloring is the so-called "plus yellow," and the second one is prevalent in America. I use the "American" coloring in all my designs. 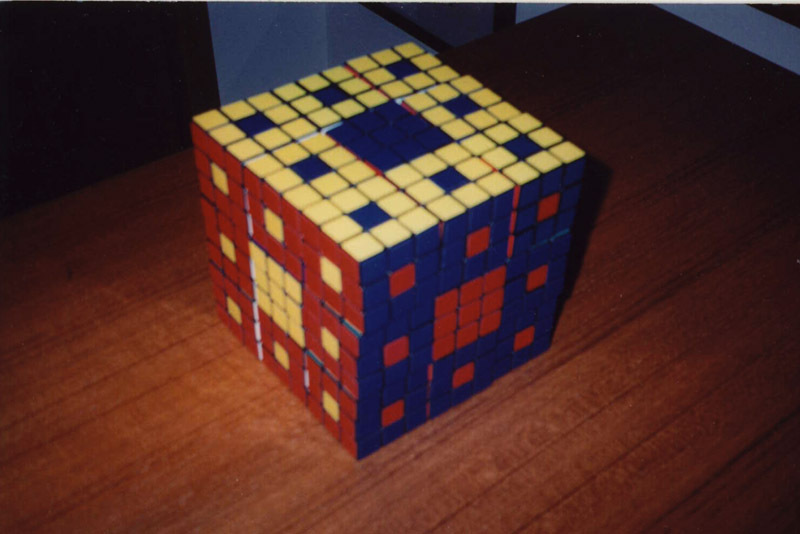 This is clearly evident in this design, because patterns on individual cubes appear on opposite faces. An exception is found on the upper and lower solved side. The Design for pedestrians is a reflection-equivalent design, with parity pairs in its corners. The orange color is suppressed (inside the design), which means that this design has 5 colors only.If you have 27 solved cubes on hand, you can easily create this design in 10 minutes of slow tweiddling, provided, of course, that you know what you are doing. A three-color version of this design also exists, but it is somewhat more involved. In this figure one can see a chessboard design, as a combination of two fractal prototypes, namely, box fractal A and box fractal B. This design is a first-iteration prototype, or seed. We obtain second iteration by replacing the background with seed and by replacing the space with clean cubes. 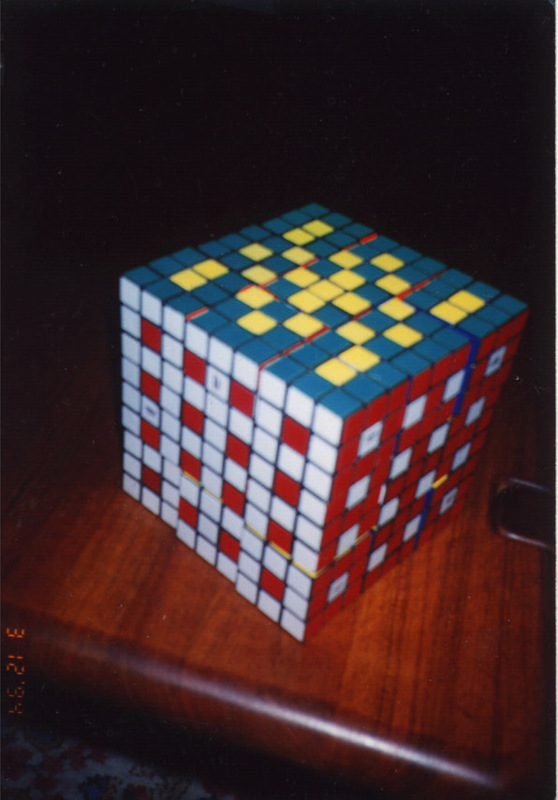 Except that in this case we do not replace each cubie by a Rubik's cube, but by a "square" consisting of 3x3=9 cubes! The second iteration will not be a square/cube having 9/27 Rubik's cubes, but a square/cube having 27/729 Rubik's cubes! But it can be done, I am certain of it. Now we are going to look at self-similarity and dimensions of fractal prototypes listed here. The dimensions of all fractals are different, and their value D is: for box fractal A D=ln(5)/ln(3); for Menger's sponge D=ln(8)/ln(3); for box fractal B D=ln(4)/ln(3) and D=ln(41)/ln(9) for chessboard design. Iteration does not alter a dimension of a given fractal; this is due precisely to self-similarity. When the rules of iterations were developed here, this fact was taken into consideration. Question is, whether other forms of iteration exist, e.g. successive iterations of two functions by way of: f1, f2, f1, f2... What type of object would be created in this case? And what if instead we iterated f2, f1, f2, f1...? We can call the box fractal A f1 and Menger's sponge f2. I can imagine what this would look like for a very small number of iterations, because I soon run out of cubes. A computer program that would draw these pictures by applying our rules would come in handy. There is more, but that will be all for now. Perhaps someday I will write an article about these problems. I certainly will try to make something out of this interesting problem. I don't quite know yet, where it will take me. There is always a degree of uncertainty in research, if it is a real research. I can only say this: as far as I know nobody has yet made a connection between Rubik's cube and fractals, and investigate this (maybe) new pursuit. But it's worth the effort. 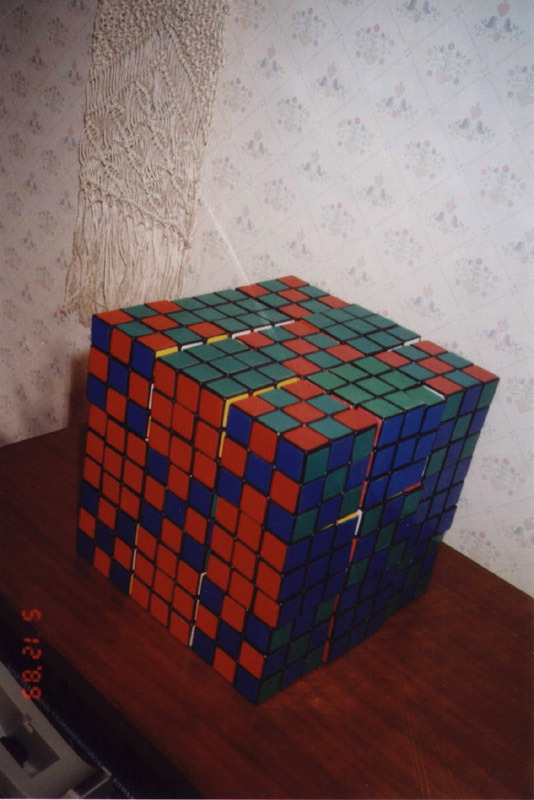 I am asking all of you: has anyone heard about the existence of three-dimensional designs on a set of Rubik's cubes and a connection of these designs to fractals? If you have, please inform me of this via email. One shouldn't play with the cube aimlessly; this is very boring. Rather, your game should have a purpose; to extract desired mathematics and physical results.